In Coronation tapestry we see a coat of arms with the French fleur de lis, crown and foliage. Based on traditional French symbols of royalty we see in this piece a gorgeous blue and yellow fleur de lis central emblem, with a red and gold crown, surrounded by a wreath of leaves and garlands of flower and foliage, with a golden background. 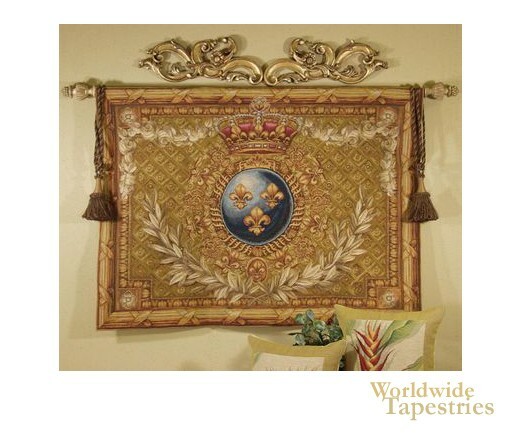 This royal crest or coat or arms tapestry is backed with a lining and has a tunnel for easy hanging. Note: tapestry rod, tassels and accessories, where pictured, are not included in the price. Dimensions: W 58" x H 43"